Have you heard of Slack for fast, anytime/anywhere team communications? It may be the email substitute you have always wanted. Let’s take a look at what it can offer you and your staff. Slack is a free, real-time messaging, archiving/search tool in use by 5.8 million weekly active users. It uses channels to organize conversations, which are then threaded together. You can create any channels you might need, which means you could have one for each grade level or department, one for planning social events, one for the technology department, etc. If a channel is no longer needed, you can leave it or delete it. Because the channels are threaded, anyone who joins a channel after the conversation has already begun can still read what has been happening. And you can add documents, video, audio, graphics, and URLs to any Slack message, which makes it perfect for sharing information quickly. In addition, Slack can be used to instantly message individuals as well as groups. And there is a free app available so that you can check for communications from any device. 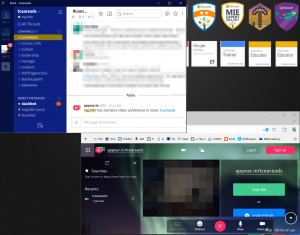 With a little practice, Slack can quickly take the place of a host of other apps and programs for communications, calendars, and reminders, enabling everyone to be more productive and save time. 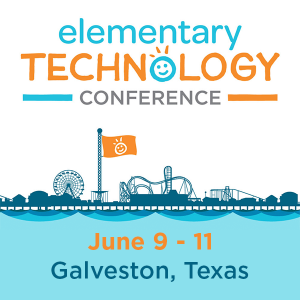 The TCEA staff have used Slack for the past year, and really love it! Let’s explore some tips for using this tool. Find out more via their Help Center. Tip #1: Establish clear guidelines for Slack communications. While Slack may feel like the casual instant messaging you do with Facebook Messenger, staff need to remember it is work-related and that workplace policies apply. It might be helpful to remind them of this periodically. In addition, you may want to add a channel just for the sharing of fun things (such as a local restaurant having a special or a cute kitten video). Staff members can opt in or out of this channel as they wish. Tip #2: Take advantage of hashtags, stars, and app add-ons. 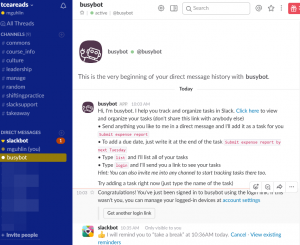 Add-ins like BusyBot can be added to Slack to create to-do lists and engage in task management. You can also add reaction emojis to heighten interaction without the need for tapping in a message, which can be a real time-saver. Tip #3: Create channels to house topic-specific conversations. You can use channels for open conversations focused around a specific topic. Channels are searchable and archived, unlike direct messages to other team members. Tip #4: Format Slack communications with simple keyboard hacks. Want to *bold* or _italicize_ a word in Slack chat? Place asterisks to bold and underscores to italicize. Quote content by placing a less than symbol (<) in front of it. Tip #5: Set reminders in Slack. There are many other great tips available online. Appear.in: Provides for eight call participants, and you can use the /appear slash command to start a video conference in your channel, making it easy for others to join the call. Google Hangouts: Start a Hangout with /hangout in any channel to get a link to share with others. A Slack control panel will appear and you can invite other Slack team members to the video conference. VideoLink2.Me: This offers audio/video conferences with file and screen sharing directly in your web browser. It supports six or more people, depending on the users’ internet bandwidth and connection speed. Use the /videolink slash command to create a conference room and share its link to your channel. Google Drive: Install this integration to create Google Docs and import any type of file from Google Drive without leaving your conversations in Slack. Dropbox: This integration will import Dropbox files into Slack so you can share your work, get feedback, and collaborate with your team. Box: This integration will import Box files into Slack. Imported files are searchable and shareable in Slack, but will continue to be stored in your Box account. Imported files will be automatically updated when the corresponding Box file is updated. Want to learn more about how Slack can simplify your work flow and assist your team in becoming more productive? Be sure to attend the Productivity Tools for Administrators workshop on Thursday, June 15, 2017 in Austin. Register here.